Once in a while, big thinkers at healthcare organizations gather round to brainstorm ways to keep their company competitive, searching for quick wins and easy tactics to inch past the competition. But making business decisions based on the actions of competitors means that another crucial element in every sound business strategy takes a back seat: the customer. To thrive in a competitive market, healthcare providers must learn to lead with their “secret sauce”—the one unique thing they do better than anyone else—and cater to customers who prefer the flavor of those offerings. With this secret sauce, which should be a large part of an organization’s revenue, providers can build a better strategy to be successful in the industry, reconstructing market boundaries to take their products and services from local to global. So what’s holding back organizations like yours from leading with your own secret sauce? A digital-first strategy. You can’t aim big until you embrace digital, and you can’t expect to stick around if you leave it behind. 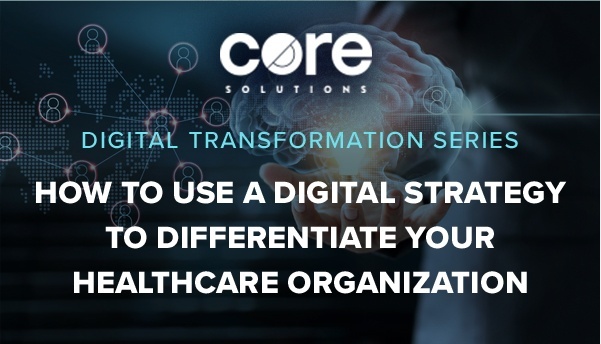 To differentiate your healthcare organization from direct competitors and future rivals, you’ll need to employ a digital-first mindset to build a better business model. A strong digital strategy made stronger through trusted partnerships with technology providers and payers can allow even the smallest company to create an ecosystem with the influence and power of a much larger entity. If you were launching your company today, how would you build your business differently? How would you use digital technology to differentiate your brand in the market? How would you leverage all the tools available to you, such as optimized websites, portals and apps, to create a cohesive customer experience? If your business is like most healthcare organizations, your team probably expects to be disrupted by digital technology in the near future. But by following a digital transformation framework and asking the tough questions along the way, you can overcome digital disruption for long-term success. There are three key areas you need to focus on to start building your own digital transformation framework. It’s also important to recognize that this should be constructed at the leadership level; giving new shape to your business through a renewed vision falls on leadership’s shoulders so that these messages can permeate the organization and last. 1. Vision: Create a compelling vision that repositions your organization as a tech-focused, data-driven startup. Do your current mission and vision statements inspire your team and drive action? Do they take into consideration the way technology will help your company innovate and remain forward-thinking? Now’s the chance to improve them by taking a tip from today’s most successful startups. Revisit both statements and update them to reflect a digital-first strategy and better align with the current culture of your company and the goals of your team. Think big and aim to be great, but remember that your people are your greatest assets. A strong vision platform will guide your staff’s behavior and actions, impacting their work and even affecting the way your consumers, partners and funders see your brand. Connect all the dots with positive mission and vision statements that motivate and empower people, inspiring action and evoking emotion. If you’ve got it right, they will help your team make good decisions that push the brand forward. Every healthcare organization has the opportunity to create a very successful business, but it starts with a vision. 2. Tactics: Plan out the digital tactics that will help your secret sauce shine and your brand work cohesively inside and out. Once you’ve identified your true secret sauce, make a list of the internal and external digital tactics that will help your organization function efficiently on the inside and appear just as “together” on the outside. Internal tactics should aim to increase everyday productivity and collaboration for staff, and external tactics are put in place with all those who engage with your brand in mind. With the context of your secret sauce and renewed vision, consider how digital technology can elevate your company to achieve your ultimate long-term goal. 3. Customer Experience: Digitize the end-to-end customer experience to make it better, faster and more cost-effective and help customers reach their desired outcomes. Make the most of your digital external efforts by optimizing the end-to-end customer experience to give your clients or patients the three things they want from their healthcare system today. Look for ways to leverage digital tools to offer improved services that are more cost-effective and easier to use, and start making plans to address consumer pain points as your products and services evolve. Digitizing the customer journey means establishing digital touchpoints that are cohesive, painting a clear picture of your brand and the big focus you place on exceptional customer service. If you have a website and an app, design them to be united in look and feel and approach their UX from the consumer’s perspective; a user’s experience should be intuitive, offering all the tools they need to bring them closer to their desired outcomes. Interested in learning about the role of EHRs in a digital transformation framework? Request a demo of our EHR solution below to get to know our platform, our organization and our team.